Awning Rail – in order to attach a free standing awning to a T6 you will also need an awning rail. Our T6 awning rail moulds to the curve side of the vehicle and provides a stylish professional look that won’t detract from the overall look of your van. Constructed from coated aluminium it provides a solid and dependable rail which will accept either a quick release figure of eight clip on/off or threaded piped edge system for attaching the awning. Having tried and tested a variety of tents and awnings, we highly recommend the Khyam products as probably the best on the market. • Very well constructed with high quality tough materials and with fully taped seams to avoid leaks. • Extremely quick to erect. With no poles to thread all you have to do is click into place two prethreaded poles – with a little practice one person can erect the awning in 10 minutes and take it down in less. Motordome Classic Awning – free standing awning giving 9 square metres more space! There’s no threading the awning on and off, just click it on and tension the awning up – this also means that you can also simply unclick and drive away in seconds. The awning then has a full side that just zips up to leave what looks like a regular free standing tent – you can leave all that extra gear safely in the tent, go off for a day out and save your campsite pitch! It is possible to also include an inner tent with sleeping compartment, a separate ground sheet and an extra add on sleeping extension. T6 Tailgate Awning – attaches over an open tailgate and gives 2 metres by 3 metres of living space with an option for a 2 berth inner sleeping tent. We offer three different options on sunshades, from a simple fold away to the permanently fixed boxed style above the side sliding door. • Khyam – a simple lightweight folding sunshade. With three poles and guys it is fast to put up and down. It packs up small and is easily stowed away. • Isabella – more robust than the Khyam sunshade and made from a thicker fabric. 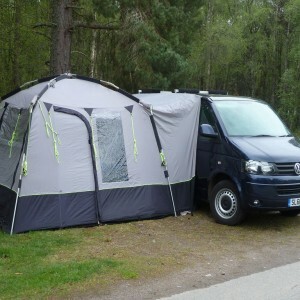 More sturdy in a strong breeze but bigger to pack away and more expensive! • Fiamma – a permanently fixed aluminium box above the side sliding door that keeps the sunshade rolled up inside. It rolls out easily in less than a minute and is available on all out layouts. 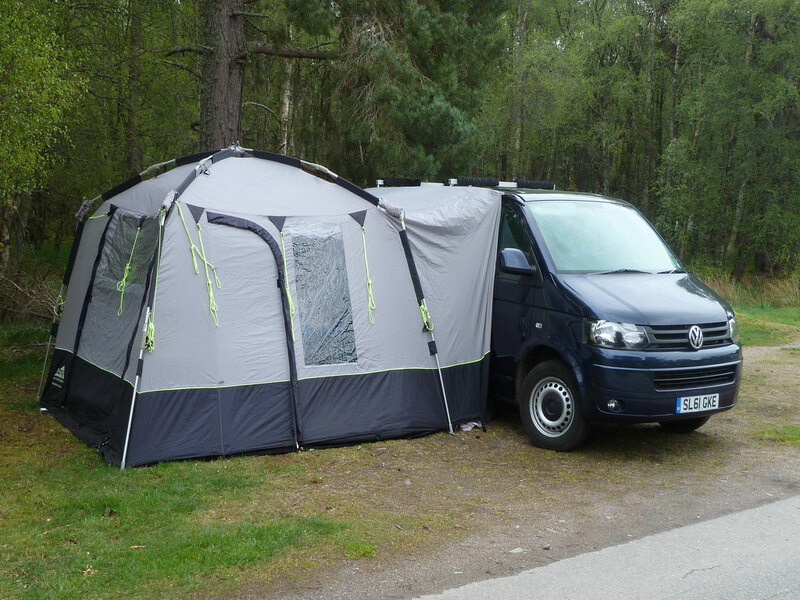 Sections for the front and side are also available so you can create a fully enclosed awning, however, driving away and leaving the awning standing is just not possible as it is an integral part of the van. On our elevating roof designs it also requires the awning rail to be fitted as part of attaching the box to the vehicle. By far the most expensive sunshade of the three!